Blurb A participation of the Single Player Mapping Challenge. 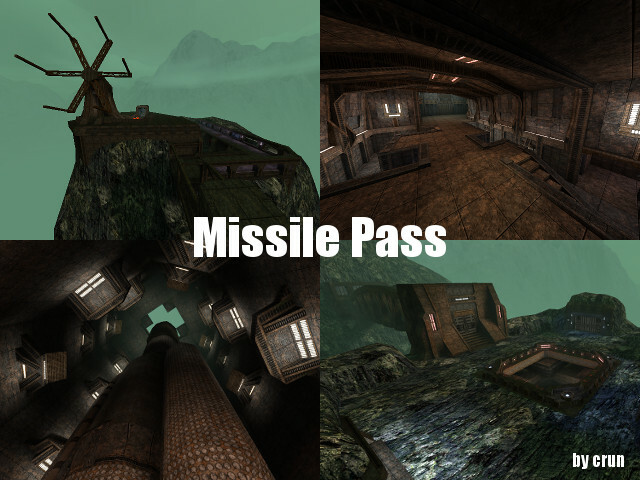 Missile Pass is a Singelplayer campaign that takes place in a rough and fogy mountain landscape. Beside those outside areas there are quite narrow inside structures that are designed in a verry technical look. 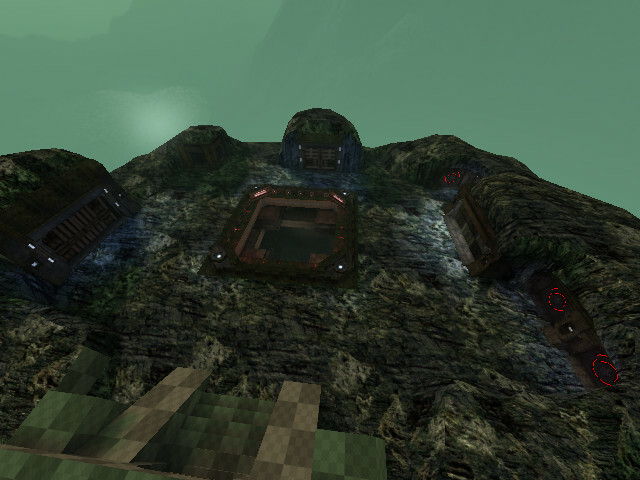 The level design provides arena shooter elements in combination with some puzzels. But with some cleverness you shouldn't have problems to solve those puzzels or finding enough ammo, since i'am also not a person who likes it to feel lost in a too complex level. A Dark Matter Bomb isn't about to launch, it has been launched. The only way to stop it on its way to earth is to get into the control center of a foreign species as fast as possible and manipulate the communication with the bomb. But to reach this base in well protected mountains you have to pass all their security lines.. Credits: Thanks to Simon O'Callaghan for the textures. Nice to see you've finished the major sized map in time in the looking part, too bad not in gameplay part as well. Maybe you should have taken 1 step smaller instead of such huge size, but that's a statement which fits better back in June (although I tried to say so by limiting the amount of wtr (nice 150k you got there ^^), map-size, amount of monsters and file-size). I've got to admit, for a "newcomer" you've done an amazing job so far. I hope to see this map actually be playable next week. I will wait a finished version of your map, but current version looks not bad. And yes, for newcomer this work is cool. Same here, I'd really live to see this map finished. Great job this far! Too bad this map still isn't playable even after 2 weeks of waiting. Can't rate it any higher as being 2nd of all maps on my list within the challenge. I vote 3rd place in the mapping contest, too bad it wasn't finished. Thank you for your comments so far. Yeah im still working on it and will do my best to get it finished..
@Mmeaninglez Yes, you're right. 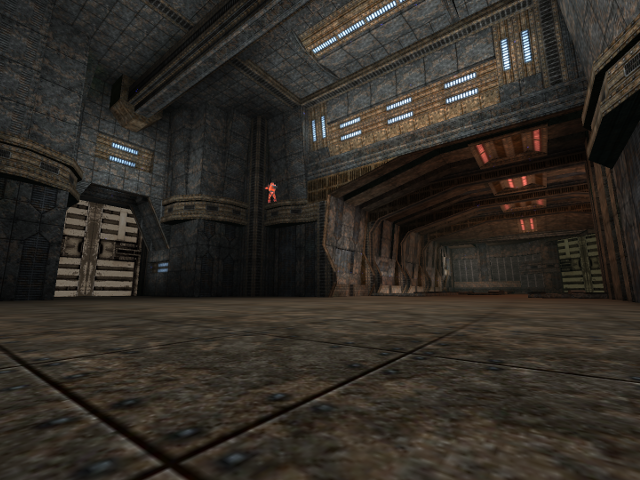 In my current version the laser particles in the elevator are alredy a clipwall. But yes i thought it would be ok to deathclip the top of the missile exit, as it would not make sense if you drop down there. This map has excellent atmosphere and an impressive size and even though there are some lighting and texturing flaws it's an excellent map for a newbie :) Sadly you didn't finish in time, so it, at it's current state, is not really playable. That throws it back to place #2 on my list, even though it has such great potential. I won't rate it until it's playable and because I know that an update is about to come, but I'm really looking forward to the finished product! Happy Bumpy Bump: I finally made it to a stable release and hope you will enjoy my map! I'am also quite sure that there are still plenty of minor bugs and stuff to fix, so i will publish an update or make a final release at some time. As Mmeaninglez already stated, there are a lot of things which are quiet illogical (flow based), like not being able to jump over some small fence (which has tiny laser particles positioned vertical, ok?) in the rooms around the rocket. I'm sure you could do better than that. During my journey in SinglePlayer on the map, I sometimes felt like lost. I had no clue where to go or what to do. For example, killing those workers in the control room of the bridge could be guided a little better (like "Looks like the door is controlled by a switch in the room above. Let's try to kill the workers which are within the control room from down here!" instead of "Looks like that gate is blocked by the workers in the control room over here"). I also noticed a lot of places where you actually are being forced to use kill or even can't finish the map. I have to admit, it has some nice cubescripts compared to any other participating map. Anyway, If I was able to change my vote, I wouldn't do so. This map deserves to be 3th due it's gameplay. I would rate it 7/10 as being a newcomer around here. That's actually not the point within gameplay =P. I can agree with suicizers comment and I want to add my personal experience which I collected while playing it several times. What I'm going to criticize on are mostly details, so take them as examples. I wrote this while playing and restructured it. 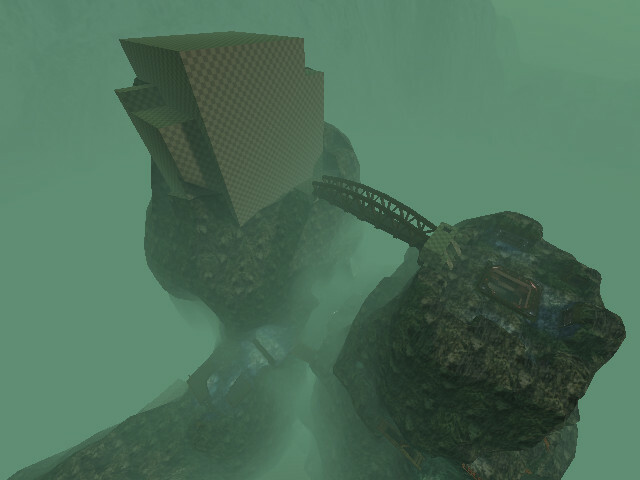 -The death clip usage in general and especially around the bridge (that one that has to be "fixed"): why is there death clip at the mountainside next to the bridge? It just doesn't make sense to me. 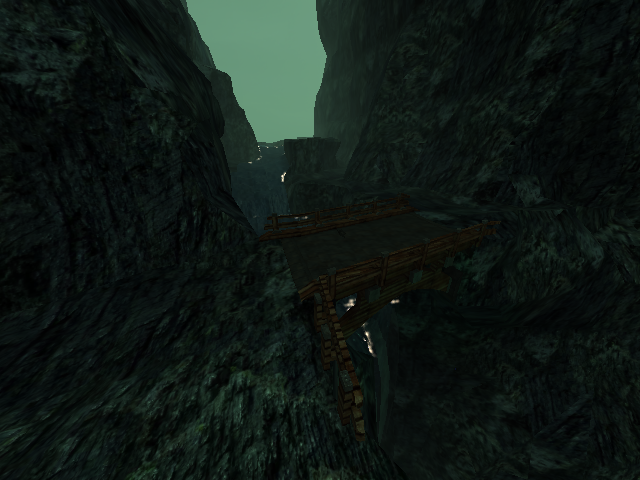 Additionally, when I'd triggered the lever, opened the bridge and jumped down, I got caught by the death clip. -ofc the old story of the red laser fences..
-Simply cause it isn't logical: I don't want to die in that river! My first intention was to explore the water current's cave..
-you could place the monsters more rationally. At the beginning, for example, why don't they take care of the control tables? -I finished the fight against the lot of monster on top of the rocket mountain with 12 HP because i hit miself once with a QD grenade. :D The amount of monsters was okay, but I in the end I hadn't got without any weapons left as I killed the last few with the chainsaw. -to be honest, at the first time I needed quite some time to find the "broken grill". I think, it would be nice if one was guided by light maybe? Or if you enlarged the steam particles? First of all i'm glad that no one got stuck in my elevators until now and you like my map. I checked out the clipping/gameclipping and yes, there is definitely room for improvement.. In case of the fence with it's laser particles I looked for a design, that is low enough to look over and represents a clipwall. But to generally handle the "laser clip" problem i might even have to forgot those laser particles and let the geometry do it's job here. To make the part with the control room and the main bridge a bit easier i decided to lower the sleep time for the alredy existing hint "You have to eliminate the two workers in the bridge control room." from 20 to 10sec. "I sometimes felt like lost"@Suicizer You could really help me out by describing the places/situations where exactly you felt lost. Hmm. [You opened the bridge and jumped from the control panel right into death.] That's bad, but also means you answered your question from "General & layout" point 3. by yourself, didn't you? The fact that the floor was already closed when you approched is a bit strange, since these triggers open when the script initializes. Probably this command was fired to fast after the map load, so i just surrounded it with a little sleep. The monster placement isn't always logical, because it's a fact that they are not the smartest in finding a path to the player and they tend to get stuck on every little corner(especially in narrow rooms). To prevent a lack of ammo on the 2nd mountain i could force the player to take the quad just before the fight starts. -I have to think about that hmm.. 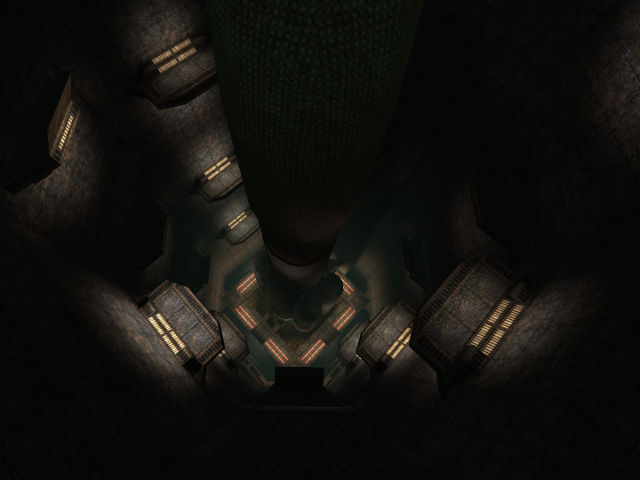 Yes, I fixed the texture in the first elevator room and enlarged the steam particle at the "broken grill". I also added a little advise about that "broken grill" in the dialogues. Isn't it ok when a special item like a healthboost, an armour or a quaddamage is placed in a dead end? I will try to upload the next version of my map on this weekend. Yes you're right, the river's great the way it is. You see I just collected ideas while I was playing, I don't have the practical experience which you have for example concerning monsters.